that is one specific curse! i'm definitely going to keep it in mind, so people better learn now not to cross me! The only other curse that comes to mind right now is from (I think) an old country song: "May the bird of paradise fly up your nose, and may it tickle when it goes"? That was always one of my favourites. Of course, there's always the ancient Chinese curse: "May you live in interesting times." None of my curses match that one. I like it! 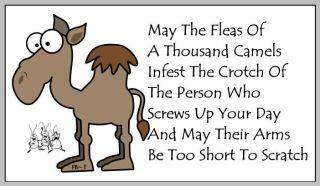 That's a great curse - and a cute camel. what a great curse. can't think of any offhand but if one jumps out at me i'll let you know. That's a new one for me. Love it. I know exactly who to send that little diddy to. Thanks for the curse guidance!